Situated in the centre of one of Halton Region’s most picturesque pioneer villages, Kilbride United Church will be celebrating its 150th anniversary in 2010. This attractive frame building, once known as Zion Methodist Church, New Connection, was built in 1860 on Eighth Sideroad, east of Panton Street. The land was donated by George and Rhoda Harbottle Senior and deeded to the church for five dollars. 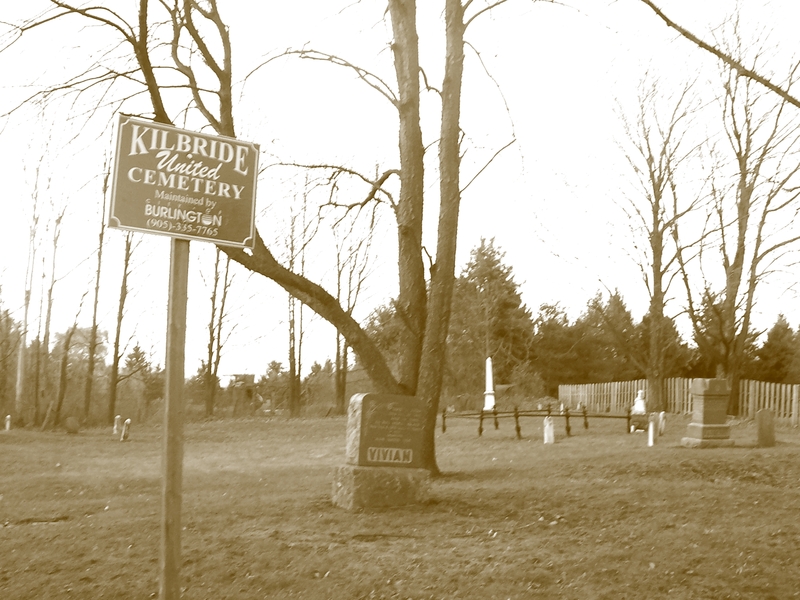 The residents of Kilbride felt that the church was not close enough to the centre of the village and in 1881 it was decided to move the church. Hall Gunby and Mr. Curliss, with the help of local farmers like James McNiven and their oxen, formed ‘bees’ and rolled the church through the village to the present location donated by Charles Harris. The vestry was torn down and the “Old Sunday School Room” was later erected. A reopening ceremony was held, with Rev. John Turner officiating. The speaker, Rev. James McAlister, was the grandfather of Rev. Alfred McAlister, minister of the church from 1978 to 1986. Donations given that night were sufficient to completely retire the church debt. The cemetery remained where the church was originally built, marking the graves of the forefathers who laboured so earnestly to establish their place of worship. When electricity was installed in 1927 the old coal oil lamps were stored under the choir loft. Years later they were rediscovered, restored and now hang in the sanctuary. In 1960 to commemorate the church’s 100 year anniversary Laura Dixon published this booklet detailing the history of Kilbride Church and the community. Over the years several additional rooms were added and the “Old Sunday School Room” was renovated with new furnaces and kitchen, but the sanctuary remains much the same as it was over a hundred years ago.